Re: Possession (formerly Possession 2) - Steam page up! First of all, I thought I’d changed the Steam release date from January 2018 back in December, but apparently I didn’t save it, so it was still showing as January 2018 up until a week or so ago. Sorry if anyone got their hopes up, it’s not releasing in January. Predictably, I didn’t get as much done during the holidays as I’d hoped. But I’ve sat down, looked at what I still have to do, and what needs to be done before I can get the game out for testing. That’s going to be my #1 priority for time I spend on the game going forward. 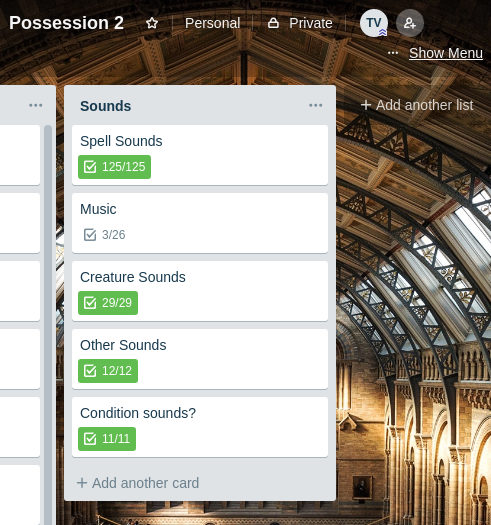 There are plenty of things I can work on while it’s in testing, or afterwards (like sounds and music), but I want to get the game in front of people to play through and help identify bugs, and problems or changes that have to be made. All in all though, really all I have to do to get it to that point is finish fully implementing all the levels and creatures, which is mostly done. Sorry for the radio silence. This summer has been crazy busy for me. I moved, and then spent almost as much time out of town as I did in town. But I'm happy to announce that as of yesterday, Possession is finally gameplay complete! Now, it's not ready for release yet, because there are still some things that need to be done (some sounds, music, and achievements, for example), but it's ready to be sent out for gameplay testing and bug hunting! It may still be a week or two before I send the game out to testers. I have to get the distributables together, and I want to run through it one more time to make sure nothing immediately horrible stands out, but I'm ready to start putting together a list of testers. Testing will be unpaid, but testers who provide solid and detailed feedback will have their name in the credits, and receive a free copy of the game upon release. I will provide a feedback form, and I expect the testers to try and play through the game multiple times (not necessarily all the way through, since it is a permadeath game, but at least multiple runs), trying to do weird things and break as much as possible. Provided I manage to get the beta out in the next week or so, I'd like to have feedback in by the end of September. Let me know if you're interested! You can email me at "contact at weirdfellows dot com" (or reply here, or send me a private message). Please include what Operating System (including distribution if using Linux) and version of the OS you're running. Either Mac, Windows, or a 64-bit Linux system is fine. Depending on the number of people who are interested, I can't promise that everyone who asks will be a tester, and I may hold off until a second round of testing for some. All the environment graphics are pretty ugly, I know…I just made them quickly for testing, the final versions will look better. Anyway, great job, we can see that it's quite polished and the feature list is impressive. Keep up! Re: Possession (formerly Possession 2) - Beta almost ready! Here's a brief update on the status of Possession. The game's gone out to a small group of initial testers, and I've got some feedback that I'll be working on. All of those were things that I was working on while making the rest of the game, but decided to put on hold to finish the content and gameplay. 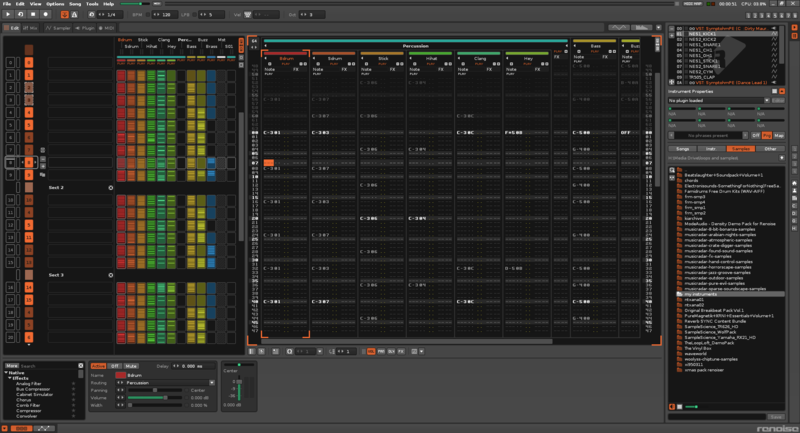 So I already had a good amount of sounds and some music made, it's not all coming from scratch here! I've mostly been working on finishing up the sounds recently, and I've been making good progress on that. I'll be sending the game out for a second round of testing to a larger group once I have the sounds and achievements done. I'll be working on the music and Steam integration while it's with the second round. I have several people who have expressed interest in testing who haven't gotten it yet, so for the time being I'm not taking more applicants. I'll make another post if that changes. I believe I'm done with creating the sounds for the game! Obviously I'm sure one or two might have been missed that will come up in testing, but aside from that I should be done with them. 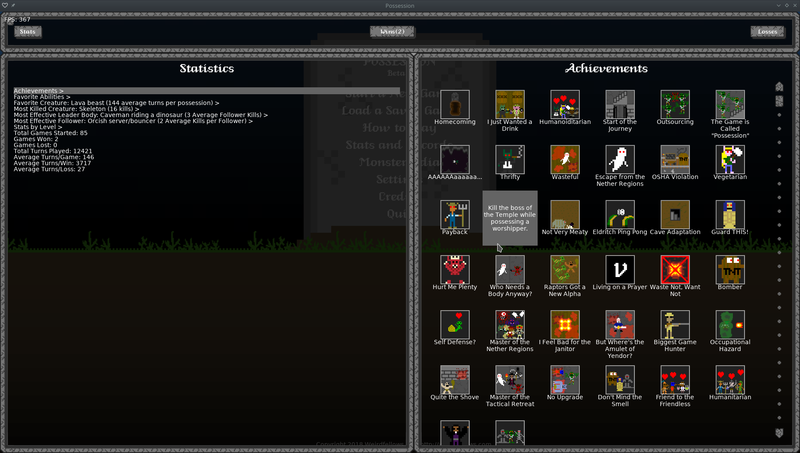 Now the last thing that should remain before Beta 2 is implementing and testing all the achievements. Unfortunately, although I really wanted to get the game out this year, it doesn't look like that'll be happening. I do plan to have Beta 2 out for testing next month, though. I've also sent the game out for beta testing round 2 (this actually happened back in December). If I'd previously contacted you about testing and you didn't get the email, please let me know! I've asked the testers to have their feedback to me by the end of January. 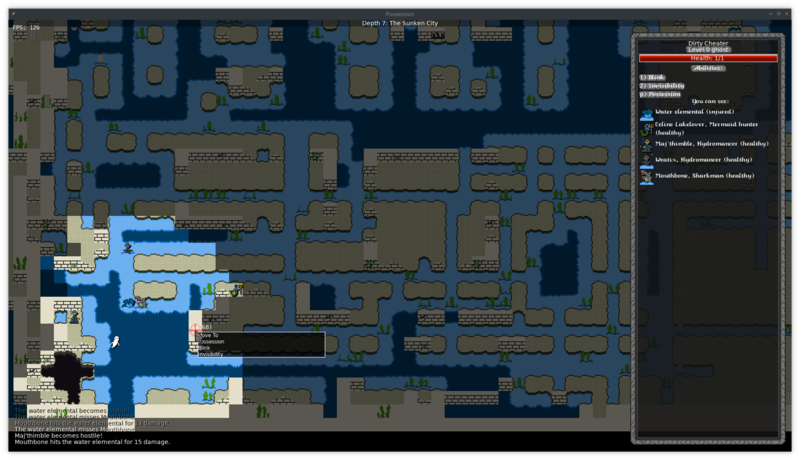 While testing is ongoing, I've been getting some work done on the music. Another thing that I realized I need to do before release is ensure that modding works properly, and to do that I need to actually create a mod! So I'm creating an entire extra level, with unique creatures, features, etc. to test that it all works. I'll also be releasing the source for so it can be used as an example for any mod-makers. To make things clear: While Possession will support extensive modding from Day 1, the Steam version won't have Steam Workshop integration in the initial release. I hope to add it down the line, but I honestly haven't really even looked into what that will entail yet so I can't promise it. This looks pretty good, sometimes polishing the last details and testing can be súper tough, just keep going you are almost there.